Lati, a leading European compounder of engineering polymers, has successfully developed an X-ray opaque compound for use in filaments used for 3D printing. 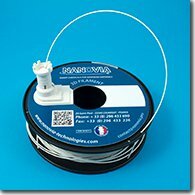 Using either a PLA or PC based compound, Lati worked with Nanovia, a specialist in filaments for 3D printing, to produce a filament that is both easy to handle and produces a high quality printed item. 3D printing as an industrial manufacturing tool is becoming a reality thanks to the extremely fast evolution of not only hardware equipment and control software, but also resins used for the extrusion of filaments. After the 3D printing stage for the development of prototypes, the market is now beginning to demand materials able to process real functional products also valuable for their technical features, such as electrical conductivity or mechanical performance. Driven by these requirements, LATI SpA (www.lati.com) decided to deploy its know-how in the field of thermoplastic compounds. The purpose is to create a range of filaments for special use, intended for the most demanding makers in the industrial and professional field. Nanovia, a specialist company in the world of filaments for 3D printing with filament melting technique, decided to turn to LATI for the development of a compound suitable for the manufacture of X-ray opaque filaments for additive manufacturing in the field of personal care. LATI successfully proposed its LATIGRAY range material based on suitably modified PLA or PC polymers filled up to 70% by weight with high density ceramics. The presence of these ceramics ensures variable X-ray opacity to obtain the desired contrast. Despite the challenging formulation as regards the composition, the filament is flexible and easy to handle and unroll, and is highly suitable for extrusion through the nozzle of the 3D printer. The melt rheology allows, in fact, the rapid and safe deposition of precise layers without interruptions. The moulded part is compact, with firmly adhering layers without deformation. Despite the high filler content, the quality of the obtained surface, too, is remarkable. This performance is the result of the joint effort of LATI and its partners in the world of 3D printing, an area that required the review of technological choices and usual production methods for a manufacturer of compounds for injection moulding. LATI’s range of materials for additive manufacturing also includes grades for electrically conductive, self-lubricating, self-extinguishing, and metal detectable filaments.